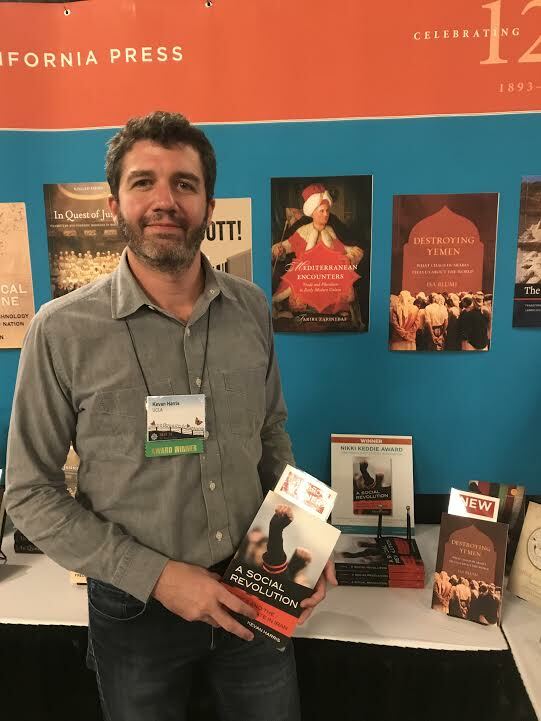 UCLA International Institute, November 26, 2018 — “A Social Revolution: Politics and the Welfare State in Iran” (UC Press, 2017) by UCLA’s Kevan Harris won two prestigious awards at the recent annual meeting of the Middle Eastern Studies Association (MESA) in San Antonio, Texas. The monograph received the 2018 Nikki Keddie Book Award for exceptional scholarship in religion, revolution and/or society and the 2018 Middle East Political Economy Book Prize for exceptional critical work on the political economy of the Middle East. The former prize is awarded by MESA and the latter, by the Political Economy Project of the Arab Studies Institute. Both awards were announced for the first at the MESA annual meeting, held November 15–18, 2018. Given the book’s positive critical reception and recognition by the scholarly community, it may soon become a standard text in university courses on modern Iranian politics and society. 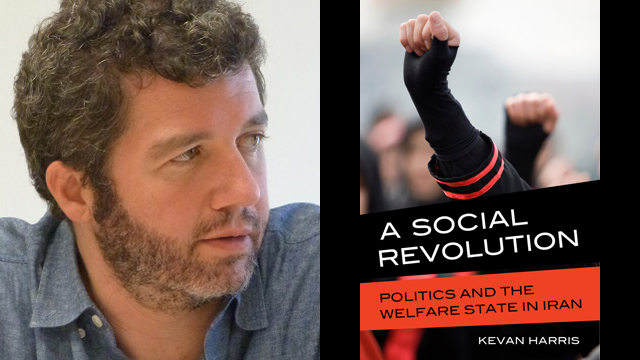 “It is a great honor, as well as a humbling experience, for ‘A Social Revolution’ to have been awarded two book prizes at the 2018 Middle East Studies Association conference,” says Harris. The Nikki Keddie Book Award was created in 2017 in honor of UCLA Professor Emeritus of History Nikki Keddie, a world-recognized historian of Iranian social history and women’s history in the Middle East. The award is one of three annual MESA book awards and was conferred for the first time in 2018. It has a special meaning for Harris, a comparative historical sociologist who joined UCLA in fall 2015, where he has a joint appointment to the UCLA International Institute and the sociology department. Harris shares the 2018 award with co-winner Orit Bashkin of the University of Chicago. Harris contends that the post-revolutionary state managed to maintain the loyalty of the Iranian public during times of internal conflict and foreign wars via the expansion of literacy, women’s education and the lowering of infant mortality. But at the same time, and more significantly, this new welfare regime stoked a broader dissensus within society along with competition among elite factions. The Middle East Political Economy Book Prize was first conferred in 2016 and is awarded to publications across academic disciplines that have a political economy theme. The prize and the Political Economy Project are closely associated with Jadaliyya, a free electronic magazine published by the Arab Studies Institute that features content by academics, journalists and other commentators in English, Arabic, French and Spanish. The book has been equally well-received by Harris’ peers in the scholarly community. “In my opinion,” says anthropologist and filmmaker Narges Bajoghli, assistant professor of Middle East Studies at Johns Hopkins School of Advanced International Studies, “it is one of the best books on post-revolutionary Iran to be published in some time. Harris attempts to de-exceptionalize the Islamic Republic, moving away from the predominant western framework of explaining the post-revolutionary Iranian regime as an anomaly. Instead, Harris paints a complex picture of Iran and refuses to make simplistic divisions between state and society. Harris is currently pursuing research on welfare politics in low- and middle-income countries, business-state relations and class and social mobility in Iran, and the history of social policy in West Asia and North Africa. In 2016, Harris and the European Middle East Research Group (EMERG) of Lund, Sweden, collaborated to conduct a nationwide telephone poll in Iran of a representative sample of 5,000 Iranian residents (the Iran Social Survey) following the 2016 Majiles and Assembly of Experts elections. See “Voter Behavior and Political Mobilization in Iran: Findings from the Iran Social Survey,” co-authored by Harris and Daniel Tavana, on the poll's findings about political participation in Iran. Harris is currently working on two additional reports on findings from the Iran Social Survey, which are expected to be published in early 2019.